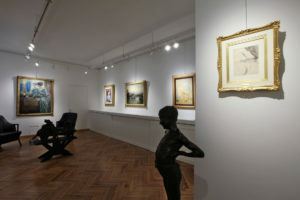 After some time, during which it began to establish a reputation, the gallery opened a new branch in the heart of Milan, in February 2010. Situated at 25 via Manzoni, the gallery grew with the addition of another exhibition space in the spring of 2015. Over time, Enzo Savoia has been able to refine his knowledge through long and careful study of the events that have come to characterise Italian painting of the nineteenth and early twentieth centuries. This has allowed Savoia to become considered – even by the academic community – as an expert in the field, often requested for his expertise and for authenticating artworks. An admirer of beauty, his guardian and creator, to whom Savoia owes his rediscovery of extraordinary masterpieces from the nineteenth and twentieth centuries, including The Acrobat with violin by Antonio Mancini (1852-1930), The Summer Stoll by Giuseppe De Nittis (1841-1917) and The park of the Villa Borghese by Giacomo Balla (1871-1958). For this reason – amongst others – Bottegantica is able to offer to art lovers a prestigious collection of paintings by Italian masters of international renown. 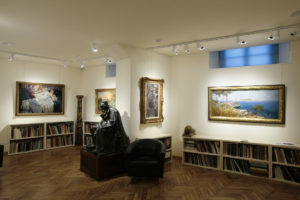 The gallery also provides consultations with public and private institutions, as well as to collectors and art lovers keen to breathe life into a personal collection. Alongside its usual commercial activity, Bottegantica hosts a rich programme of exhibitions dedicated to important Italian artists and movements of the eighteenth and nineteenth centuries. A catalogue is published for each exhibition, each written by some of the leading experts in the field. Amongst which, the six monographs dedicated to Giovanni Boldini (1999, 2001, 2003, 2011, 2014 and 2015), a leading figure in Belle Epoque Paris. The relationship between French artistic culture and its Italian counterpart has instead been explored in depth with the studies, Boldini, De Nittis and Zandomeneghi. Three Italians in Paris (2014), Belle Epoque. From Boldini to De Nittis (2014) and Belle Epoque. Boldini, De Nittis and Zandomeneghi in Paris. The show, Antonio Mancini, rebel genius (2016), achieved great international success, and celebrated the life and work of the most original and renowned Italian artists of the nineteenth century, whose paintings form part of the collections of some of the most prestigious museums in the world (Musée d’Orsay in Paris, the National Gallery in London, the Metropolitan Museum in New York, and the Museum Mesdag in The Hague). The interest in the refined world of Italian collecting instead proved the inspiration for the study, The Ingegnoli Collection, History of a passion for art in Milan (2017). The esteem and the experience acquired after more than thirty years of activity, have allowed Bottegantica to earn the respect of collectors, experts, and conservators from museums in Italy and around the world. Bottegantica regularly exhibits in several of the most prestigious art fairs, including the BIAF (Florence International Antiques Fair), Masterpiece London, and Paris’s Antiques Biennale: events attended by both the commercial sector as well as by museums and other public institutions.